Done Rite Roofing based in Tampa Bay area of Florida has carved goodwill for itself by continually using its financial and human resources for delivering premium commercial and residential roofing services for nearly 20 years. 1 February 2018, Clearwater, Florida, USA: Houzz is a front line web-oriented community of homebuilding, home renovation, and home redecoration professionals that prides on having over 4 crores monthly users. Via the web-based platform of Houzz, millions of home contractors, remodelers, and designers establish contact with those who are looking to engage them for aforementioned services. The community of Houzz grants ‘The Best of Houzz’ awards in three particular areas of homebuilding, construction, and refurbishment-customer service, design, and photography. The whopping subscriber base of Houzz numbering more than 40 million go online for giving their votes for selecting the winner in each category. As far as the architecture and home design category is concerned, the winner is picked out based on the individual or institution’s dedication to design excellence and superiority. Additionally, the positive reviews and feedbacks given by the contestants’ customers are also taken into account for deciding who the ultimate winner will be. While granting the plaque (that underlines the winner’s name and category), the presenter also hands out a badge or emblem that shows up on the profile of the winner as well on his/her portal. The Houzz society has stuck with this mode of conferring award with the lofty expectation that the winner will make every effort to furnish the best possible services to its clients and establish itself as the leader in its relevant industry. At the same time, the company or individual contractor will strive to hold on to its reputation as a transparent business and attempt to bolster its standing by trying to win the Houzz award. Done Rite Roofing has been in the roofing business for long enough time that has imparted the contractor with the confidence to provide stellar services regardless of the nature of the job. The company takes pride in reiterating that it has the infrastructure and the manpower to undertake roof installation jobs, roof repair jobs, roof leak plugging jobs, roof insulation jobs, and so on. At the same time, Done Rite offers the guarantee that the firm will charge at rates that are very competitive and compare with the most affordable quotes offered by its competitors. That does not in any way implies that it’ll sacrifice quality while conducting a roof installation or rooftop repair project. The Tampa Bay centered roofing contractor also wants to assure all its past, present, and future customers that it never delegates or outsources any part of the roofing project to third parties. 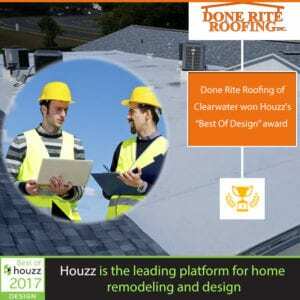 No wonder then that the vice president of Industry Marketing at Houzz, Liza Hausman mentioned that the community did everything right by choosing Done Rite Roofing to receive the ‘Best of Design’ award for 2018. Done Rite Roofing has established its reputation in the roofing industry in Clearwater and Tampa Bay Florida by consistently providing top quality roofing services in the last twenty years.